As I was going for new dishes this weekend, I came across a recipe that sounded delicious that I had to try. With Thanksgiving around the corner, I like testing recipes and/because my family definitely doesn’t stick to conventional dishes during the holiday. This recipe could definitely replace mashed potatoes! 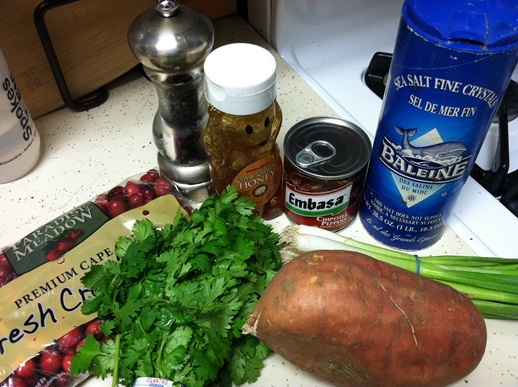 I found a Cooking Light recipe for Roasted Sweet Potato Salad with Cranberry-Chipotle Dressing. What a blend of flavors. From a little sweet to a bit of heat. 2. 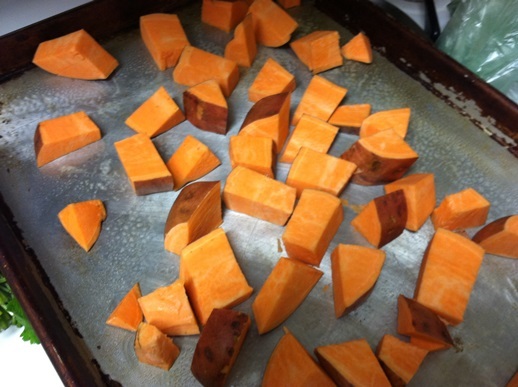 Place sweet potatoes on a large jelly-roll pan. Drizzle with 2 tablespoons oil, and sprinkle with salt and pepper; toss to coat. Bake at 450° for 30 minutes or until tender, turning after 15 minutes. 3. Place remaining 1 tablespoon oil, cranberries, water, and honey in a saucepan. Remove 1 or 2 chiles from can; finely chop to equal 1 tablespoon. Add chopped chipotle and 1 teaspoon adobo sauce to pan (reserve remaining chiles and sauce for another use). Place pan over medium-low heat; bring to a boil. Cover, reduce heat, and cook 10 minutes or until cranberries pop, stirring occasionally. Remove from heat. Mash with a potato masher or fork until chunky. 4. Place pepitas in a medium skillet; cook over medium heat 4 minutes or until lightly browned, shaking pan frequently. 5. 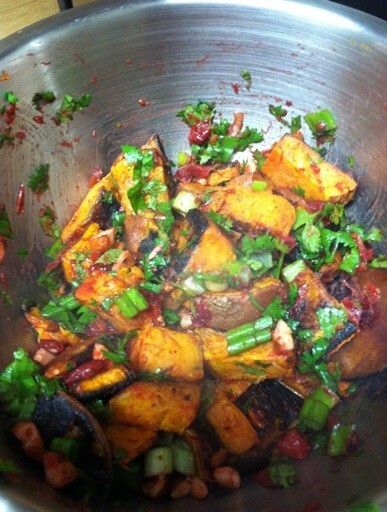 Combine potatoes, pepitas, onions, and cilantro in a bowl. Add cranberry mixture to bowl; toss gently to coat. Great, great recipe! Will totally make this again and it will likely be on Turkey Day.